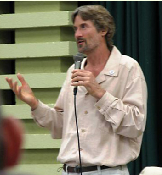 Will Tuttle, Ph.D., currently appears at progressive centers, churches, conferences, and events throughout North America and worldwide, and has been featured at thousands of gatherings, festivals, retreats, colleges, and universities over the past 35 years. His music and message have consistently generated an enthusastic and appreciative response. 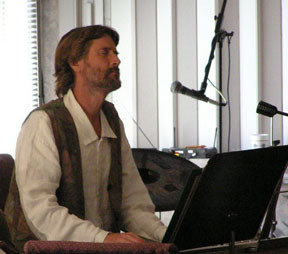 At churches and centers, he typically presents the morning message, special music, and meditation, and later gives an educational seminar on developing intuition and a concert of original piano music, "Piano Passion." These are intended to generate energy for personal and planetary awakening. Dr. Tuttle helps us awaken our intuitive powers and spiritual wisdom, opening the way to deeper fulfillment and more creative living. 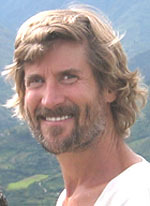 He offers the workshop "Opening The Intuitive Gate" to provide practical exercises to assist us in connecting with our unique way of accessing our intuition. Sharing principles of intuition enhancement that he developed in his doctoral research at the University of California, Berkeley, he reveals keys that can increase intuitive abilities, leading to enhanced self-confidence, creativity, and inner peace, as well as emotional healing, increased compassion for others, more harmonious relationships, and deeper insight into our life's purpose. Uplifting, philosophical, musical, inspiring and informative, this seminar changes lives, inviting our minds to make the journey to the ultimate frontier: the human heart. 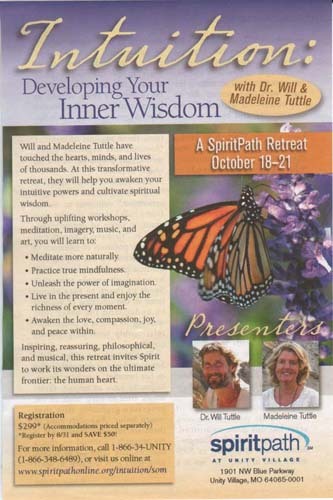 In the workshop we work with meditation, imagery, and several enlightening exercises applying Dr. Will and Madeleine's original music and art. Tools for hearing more clearly the "still, small voice"
Dr. Will Tuttle, writer, educator, pianist, composer, and inspirational speaker, has presented widely throughout North America and Europe. Author of the #1 Amazon best-seller The World Peace Diet and recipient of The Peace Abbey's distinguished Courage of Conscience Award, he has also taught over 20 different courses at the college level, including courses in mythology, philosophy, comparative religion, and creativity. His Ph.D. dissertation in Education from the University of California, Berkeley, focused on educating intuition in adults and was nominated for the Best Dissertation Award. At San Francisco State University, he received the Distinguished Achievement Award and a Masters Degree in Humanities, focusing on Zen arts. A Dharma Master in the Zen tradition, he has done intensive training in Korea, and has practiced meditation for 40 years, studying contemplative Christianity, and a variety of non-Western spiritual traditions. He is devoted to planetary awakening through spiritual education and to spreading uplifting original music through concerts and his critically-acclaimed albums, the latest being The Call, OceanPrayer, SkyHigh, AnimalSongs, Islands of Light, Ascension, and Inspiration. Rev. Tuttle travels with his spouse and life partner, Madeleine, a Swiss visionary artist, providing seminars, concerts, lectures, TV & radio presentations, meditation retreats, exhibits, and individualized music and art portraits.